This clown really is turning into a real sock puppet for Bush. This is a purely political accusation. Its a ploy to garner acceptance of a US attack on Iran. Its really that simple. The U.S. military commander in Iraq has stepped up accusations that Iran was stoking violence in Iraq and said Tehran's ambassador to Baghdad was a member of the Revolutionary Guards Qods force. I've no doubt Iran encourages the anti-occupation forces in Iraq. After all, if Iran is perceived as an ally by Iraqis, there's a pretty slim chance of another Iraq-Iran war. But, and this is a huge but, no encouragement is required for those fighting in Iraq. The presence of the coalition forces is the only thing necessary to keep the fighting going. BTW, rumor has it that a couple more awards and Petraeus will be assigned another aide to wear his new hardware because Petraeus's chest isn't large enough. Oh yes, and there's this where Petraeus basically is implying, "We've tamed Baghdad and can do the same in Iran". The U.S. military commander in Iraq, General David Petraeus, suggested over the weekend that security had improved enough in Baghdad for him to walk parts of the capital's streets without protection. 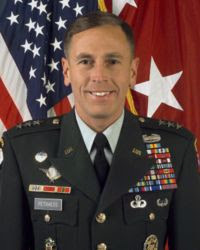 "Arguably you could do that now," Petraeus told a small group of reporters at a U.S. military base in Diyala province on Saturday when asked if there would come a day when he could walk the capital's streets without plenty of armed guards. "Nobody will let me do it," he said, smiling.